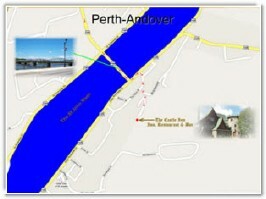 We are located at 21 Brentwood Drive, Perth-Andover, New Brunswick, Canada. If you are driving in Canada on #2 from the North, you will take Exit #115 and turn left (East) on Highway 190 and travel just 100 metres under the overpass (#2), then turn right (south) on Highway 109, following 109 for around 1km, over the bridge crossing the St John River, and left on Perth Main Street. Turn right at the Bank of Nova Scotia and drive back around, turning left onto Terrace Street, where you will turn right and go to Brentwood, staying to the left at the fork. This will take you straight ahead to the Castle Inn. If you are driving in Canada on #2 from the South, you will take Exit #115, cross the intersection and go down the hill, staying on highway 109 and crossing the bridge across the St John River and turning left onto Perth Main Street. Turn right at the Bank of Nova Scotia and drive back around, turning left onto Terrace Street, where you will turn right and go to Brentwood, staying to the left at the fork. This will take you straight ahead to the Castle Inn. If you are driving from Maine, USA, head east on highway 167 from Fort Fairfield and cross the US/Canada border where the highway becomes the 109. Travel another 5 miles (7km) until you pass under the overpass (highway #2) then turn right (south) on Highway 109, following 109 for around 1km, over the bridge crossing the St John River, and left on Perth Main Street. Turn right at the Bank of Nova Scotia and drive back around, turning left onto Terrace Street, where you will turn right and go to Brentwood, staying to the left at the fork. This will take you straight ahead to the Castle Inn. The Castle Inn is only minutes from the Trans Canada Highway and Trans Canada Trail system used by cyclist, hikers, snowmobilers, and cross-country skiers throughout the year. The Castle Inn and Restaurant large street map to show Trans Canada Highway and The Castle Inn location. 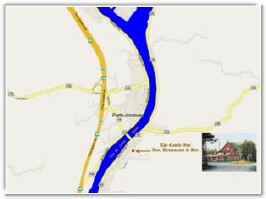 Select the image to enlarge map or click here. Maps courtesy of Google Maps. The Castle Inn, Restaurant, and Spa large street map zoomed in to show The Castle Inn location. Contact us at 506-273-9495 for reservations or more information about The Castle Inn and Restaurant. Copyright ©2019 castleinn.ca All rights reserved. Website development and promotion by wisnet.com, LLC.